Ronnie Crackers is an ideal entertainer for your child’s party, whether it is a small gathering at home or a large special party in a hall, even for a factory Christmas Party. Ron has various shows ranging from a 30 minute nursery show to a whole two hour party package, including games and dancing. Ron is recognised as one if one the best children’s entertainer in the Midlands. In fact he was voted UK Children’s Entertainer of the Year 2002, beating off competition from around the UK in a final held in Blackpool at the world’s largest magic convention. 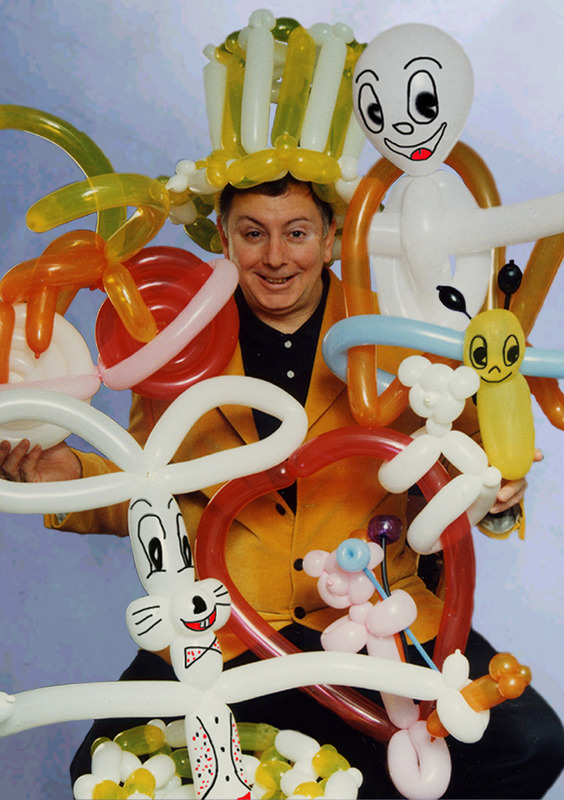 Ron entertains using magic, comedy, games, puppets and balloon animals during his standard shows. In addition he can offer Punch & Judy to make the event even more memorable than it will be already. Ron has used his children’s entertainment skills across the country and is regularly featured at Cadbury’s World, Alton Towers and Seven Valley Railway. He has also been used by major companies such as Warner Brothers Cinema, Lloyds TSB and The Merry Hill Centre. A variety show full of FUN & LAUGHTER featuring Charlie the Cheeky Monkey, who performs the world famous banana trick, and awards the Birthday Child with a magic wand so that they can help with the magic during the show. The show is full of audience participation, with lots of great photo opportunities. Magic, Balloon Modelling, Puppets, Music, Games, and Competitions. Ron supplies all of the prizes. All of the Children receive Balloon Models to take home with them. The Birthday Child gets a Magic Wand, Certificate, 1st Class helper badge, and Lots of Balloons. 5 Balloon Octopus, 5 Balloon Motorbike, Monkey on a Tree, Fish on a Fishing Rod, Jumping Mouse, Pirate Sword, Turtle, Rabbit. 5 Balloon Octopus, 5 Balloon Butterfly, Monkey on a Tree, Fish on a Fishing Rod, Jumping Mouse, Flower, Ladybird, Rabbit. The Show can take place in your home, or in a hall, very big or very small. Ron has Public Liability Insurance with British Actors Equity, and is DBS checked. With a 2 hour complete party Ron arrives at the venue 30 minutes before the start of the Party to set up and have party music playing as the guests are arriving. The Party starts with Music and Games, Ron supplies the Prizes. The Music and Games are followed with The Fun Magic Show, featuring Charlie the Cheeky Monkey, who performs the world famous banana trick, and awards the Birthday Child with a magic wand, so that they can help with the magic during the show. After the first hour we take a break for the Party food and The Birthday Cake Ceremony. Singing Happy Birthday. The break is usually 15 minutes. Then it's on with the show, with Party Dances, and Competitions. The Limbo to win Monkeys on Trees, The Penguin competition, etc. The Party concludes in a riot of colour as all of the children receive their Balloon models to take home with them. The Show can take place in your home, or in a hall. Ron has Public Liability Insurance with British Actors Equity, and is DBS checked.